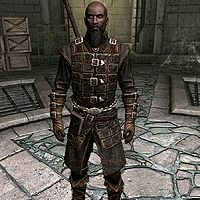 Isran is a Redguard blacksmith, a former Vigilant of Stendarr, and leader of the Dawnguard. He is one of the primary quest givers for the Dawnguard and is also the person to see if you wish to join the organization. He also serves as a master trainer in Heavy Armor. Isran is clad in a set of Dawnguard equipment. This includes the cuirass as well as matching pairs of gauntlets and boots. In combat, he wields a Dawnguard warhammer, and can use the Stendarr's Aura spell from the Restoration school. He carries random leveled bandit loot, plus a 25% chance of an additional 1-9 gold. On a normal day (though there are multiple quest-related exceptions), he gets up early at 6am, and stands around upstairs in the fort for four hours. He'll then, starting at 10am, thoroughly patrol the inside of the fort, both upstairs and downstairs, for eight hours straight. Then at 6pm, he'll once again head upstairs and stand around for four hours. He finally heads to his bed upstairs at 10pm and goes to sleep. He always seems to be worrying about vampires, as he will continuously mention the threat they pose, saying things like, "I knew it would come to this one day. I knew, and no one believed." or "Even with all my preparations, we can't be too careful. The monsters could strike at us at any moment." or "The vampires will show us no mercy. They've proven that." or "If we're going to survive this, we're going to have to be as ruthless as our enemies." He'll also warn you about sleeping, saying, "Be on your guard at all times. Avoid sleep if you can... Sleep is for the weak." When you ask him about his fort, he'll say, "This is Fort Dawnguard. Originally owned by the Jarl of Riften back in the Second Era, it was a bit of a black mark on the Hold's history. I'm trying to put it to good use." When you press him for more information about the original Dawnguard, he'll say, "Only what I've heard. Back in the Second Era, the Jarl of Riften had a son. Adventurous type, too much for his own good it seems. Wound up turning into a vampire. The Jarl, unable to kill his own son, spent a fortune building this keep and hiring men to guard it. Their job was to keep the Jarl's son contained within. They took it seriously, and served honorably. They were eventually forced to put him down. The Jarl banished them from the hold, but they stuck to their cause. Fought vampires wherever they found them. I aim to continue that mission." Lastly, if you ask him for some vampire hunting advice, he'll say, "There's only one thing worth remembering. When it comes to vampires, if you're sloppy or careless, you're dead. And good people will die because of you. I've lasted this long because I don't take chances, I cover my tracks, and I keep my eyes open. If you're smart, you'll do the same." He'll stay paranoid as you exit conversation, remarking, "Watch your back." or "Keep your eyes open." or "Stay alert." If you ask him to train you in Heavy Armor, he'll say, "Well, at least you're smart enough to want to learn more. I'll show you what I can." or, if your Heavy Armor skill is above 90, he'll say, "You already know as much as I do. And that's a compliment." When taunting an enemy, he will use one of the following lines: "No one is going to stand in my way! ", "Not even the gods will show you mercy! ", "Skyrim will be purged of your filth! ", or "I will not be defeated!" "Why are you here, Tolan?" Isran: "Tolan, tell her/him about, what was it, Dimhollow?" Tolan: "Yes, that's it. Dimhollow Crypt. Brother Adalvald was sure it held some long-lost vampire artifact of some kind. We didn't listen to him any more than we did Isran. 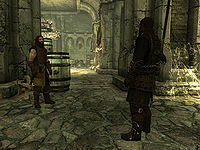 He was at the Hall when it was attacked..."
Isran: "That's good enough for me. Go see what the vampires were looking for in this Dimhollow Crypt. With any luck, they'll still be there." Tolan: "I'll meet you at Dimhollow. It's the least I can do to avenge my fallen comrades." Isran: "Tolan, I don't think that's a good idea. You Vigilants were never trained for..."
Tolan: "I know what you think of us. You think we're soft, that we're cowards. You think our deaths proved our weakness. Stendarr grant that you do not have to face the same test and be found wanting. I'm going to Dimhollow Crypt. Perhaps I can be of some small assistance to you." "You need to concentrate, boy." Isran: "Do I look like a "sir" to you, boy? I'm not a soldier, and you're not joining the army." Isran: ""My pa's axe", Stendarr preserve us. Don't worry, I think we can make a Dawnguard out of you. Here, take this crossbow and let's see how you shoot." "Watch the recoil. Takes some getting used to." "Take a deep breath and let it out as you fire." If you head back to Fort Dawnguard right after you get Serana out of Dimhollow Crypt and talk to Isran, he'll ask you, "So, any luck? Was Tolan right about the vampires being interested in Dimhollow Crypt?" If you confirm and tell him there were vampires, he'll say, "Good. I assume you took care of that little infestation. Did you figure out what they were looking for in there?" If you instead confirm but tell him Tolan's fate, he'll say, "Damn fool. I told him not to go. The Vigilants always had more bravery than sense. Did you at least find out what the vampires were looking for in there?" Whichever option you choose, you can tell him they were looking for a woman in the crypt. He'll be confused, and ask, "That doesn't make much sense. Where is this woman? Who is she?" If you tell him you don't know but she lives near Solitude, he'll say, "Well I don't know what that means. But we need to find out. She must either have something the vampires want, or be someone important to them." If you tell him she wants to go home, he'll ask, "Home? Where's that?" If you pick the last option, you can tell him she lives in a castle near Solitude, in which case he'll reply with, "Well I don't know what that means. But we need to find out. She must either have something the vampires want or be someone important to them." If you just straight out tell him she's a vampire, he'll say, "That would fit with the rest of it... I don't like it, but you did right to play along. We need to find out what this is all about." Whichever option you choose, he'll then say, "I won't lie - if this were any other situation, I'd put her down just on the chance she might be a vampire. But this is something different. I'd say do what she wants. Take her home, and see who else is in this castle." "I should've known it was only a matter of time before they found us." 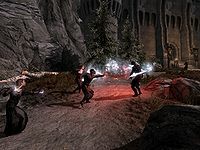 After Bloodline, if you don't accept Harkon's gift and return to Fort Dawnguard, you'll find Isran and other Dawnguard members fighting vampires in front of the fort. At the end of the battle, Isran will approach you and say, "Look at this. I should've known it was only a matter of time before they found us. It's the price we pay for openly recruiting. We'll have to step up our defenses. I don't suppose you have some good news for me." If you tell him there's news but it isn't good, he'll say, "Of course. Why did I suppose differently. Fine, tell me what you know." If you just say not exactly, he'll say, "Damn. Well what do you know?" Either way, you'll now be able to tell him that they were looking for a woman in Dimhollow. He'll be perplexed and ask, "A woman? Trapped in there? That doesn't make any sense. Who is she? More importantly, where is she?" You can either tell him you took her to her castle, to which he'll impatiently respond with, "I'm waiting to hear what any of this means." Alternatively, you can tell him that she's the daughter of a powerful vampire lord, in which case he'll say, "And so you delivered her to them." Either way, you now have the option to tell him that they have an Elder Scroll, to which he'll respond with, "They what? And you didn't stop them? You didn't secure the scroll?" You'll now have three options. If you tell him you're lucky to still be alive, he'll say, "Right. So they have this woman, and an Elder Scroll." If you tell him there were too many of them, he'll say, "So they have everything they wanted, and we're left with nothing." If instead you just tell him you never got the chance, he'll say, "I suppose you're lucky you're not dead. Or worse, one of them." Whatever option you pick, he'll then say, "By the Divines, this couldn't get much worse. This is more than you and I can handle." If you ask if he'll give up, he'll say, "When did I say that? We just need... we need help." If you tell him that we'll have to do something, he'll bluntly respond with, "Well of course we do. I'm old, not stupid. We're just going to need some help." No matter which option you choose, he'll then say, "If they're bold enough to attack us here, then this may be bigger than I thought. I have good men here, but... There are people I've met and worked with over the years. We need their skills, their talents, if we're going to survive this. If you can find them, we might have a chance." When you ask where you can find these people, he'll say, "Right to the point, aren't you. I like that. Not like those fools in the order. We should keep it small. Too many people, and we'll draw unwanted attention to ourselves. I think we'll want Sorine Jurard. Breton girl, whip-smart and good with tinkering. Fascination with the Dwemer. Weapons in particular. 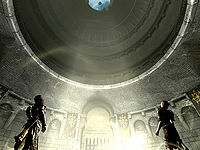 Last I knew, she was out in the Reach, convinced she was about to find the biggest dwarven ruins yet." When you ask if she'll help, he'll continue with, "Might need a little convincing, but she should. You'll also want to find Gunmar. Big brute of a Nord, hates vampires almost as much as I do. Got it into his head years back that his experience with animals would help. Trolls in particular, from what I hear. Last I knew he was out scouring Skyrim for more beasts to tame. Bring the two of them back here, and we can get started on coming up with a plan." Now, when you exit conversation, he'll say, "Find Sorine and Gunmar, and maybe we can do something about this mess." What do you have against the Vigilants? "Isn't it obvious? They're soft, the lot of them. Totally unprepared for any real threat. And yet I was the one ridiculed for trying to be ready for anything. "Too extreme", they called me. Well, that doesn't seem to have worked out in their favor, now has it?" 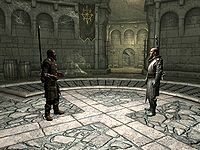 Where did the Dawnguard come from? "Vampires need to be dealt with. Hunted, rooted out, destroyed. Once there was a group dedicated to a similar cause. They called themselves the Dawnguard. That was a long time ago, but the idea was, and is, a good one. That's why I'm bringing it back. This latest attack proves it's the right time." Isran: "Hold it right there!" Isran: "Making sure you're not vampires. Can't be too careful." Isran: "So, welcome to Fort Dawnguard. I'm sure you've heard what we're up against. Powerful vampires, unlike anything we've seen before. And they have an Elder Scroll. If anyone is going to stand in their way, it's going to be us." Isran: "We'll get to that. For now, get acquainted with the space. Sorine, you'll find room to start your tinkering on that crossbow design you've been working on. Gunmar, there's an area large enough for you to pen up some trolls, get them armored up and ready for use." Isran: "And it seems we have a problem. Since you could've attacked me before now, I'm going to assume this was a little accident on your part. And so I'm going to give you a chance to get yourself cured. Go to Morthal and find Falion. He's the only one I know of in Skyrim that can cure vampirism. If you can manage that, the Dawnguard still may have use for you. I'll be waiting." The quest, Rising at Dawn, will now start. When you come back, he'll say, "Welcome back. Glad to see you've taken care of your little problem, and kept it from becoming my problem. Sorine and Gunmar are settling in." Isran: "In the meantime, we're going to get to the bottom of why a vampire showed up here looking for you. Let's go have a little chat with it, shall we?" Isran will then head to the torture room near his bedroom. He'll then say, "This vampire showed up while you were away. I'm guessing it's the one you found in Dimhollow Crypt. Says it's got something really important to say to you." He'll then turn to Serana and say, "So let's hear it." When Serana is done talking, he'll turn to you and hatefully say, "All right, you've heard what it has to say. Now tell me, is there any reason I shouldn't kill this bloodsucking fiend right now?" If you tell him he'll need her help, he'll doubtfully remark, "Why, because of that story about the prophecy? About some vampire trying to put the sun out? Do you actually believe any of that?" If you tell him to set aside his hatred, he'll say, "Set my hatred aside? Not a chance. It's what keeps me strong." If you choose the first option, you can ask him why else she would risk her life to come here, to which he'll respond, "Who knows, maybe it has a death wish. Maybe it's just insane. I don't really care." If you choose the second option instead, you can tell him to trust you, in which case he'll respond with, "You'd better know what you're doing." Either way, he'll then say, "It can stay for now, but if it so much as lays a finger on anyone here, I'll hold you responsible. Got it?" "You hear me? Don't feel like a guest, because you're not." Isran: "You hear me? Don't feel like a guest, because you're not. You're a resource. You're an asset. In the meantime, don't make me regret my sudden outburst of tolerance and generosity, because if you do, your friend here is going to pay for it." Serana: "Thank you for your kindness. I'll remember it the next time I'm feeling hungry." Isran: "Some moth priest arrived in Skyrim a few days ago. I was staking out the road when I saw him pass by. Maybe that's your Moth Priest." Serana: "Do you know where he's staying now?" Isran: "No, and I'm not going to waste men looking. We're fighting a war against your kind, and I intend to win it. You want to find him, try talking to anyone who'd meet a traveler. Innkeepers and carriage drivers in the big cities maybe. But you're on your own." He'll then leave the room and revert to his normal schedule. Isran: "We're not going to have a problem with your little... project, are we?" Gunmar: "I told you, I've prepared for this. It's going to work." Isran: "There's enough for us to fight out there. I don't need us having to defend ourselves within our own fort." Gunmar: "If you're so worried about the trolls, why agree to let me go ahead with it?" Isran: "We don't have many other options, do we?" Isran: "Can I cound [sic] on you to handle whatever smithing work we need done? Repairs, new armor, weapons..."
Gunmar: "You know I'm more than capable. Why are you bringing this up?" Isran: "I can't afford to make any assumptions. That's how people wind up dead." Gunmar: "Right. Well, you can relax. I have it under control." Isran: "I don't relax. Ever." When you successfully come back with Dexion, he will be standing in the main room. When you walk up to him to talk, he'll say, "I'm impressed you could find a Moth Priest so quickly." When you ask him if Dexion is ready, he'll say, "For the reading? Yeah. Just let the old man know when you're ready." Dexion: "I must rest now. The reading has made me weary." Isran: "Come on, old man. You should get some rest." 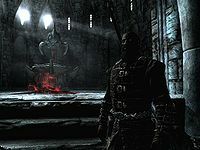 You can now ask him if he believes Serana now, to which he will doubtfully reply with, "I heard a lot of vague nonsense. You could interpret that a hundred different ways. Only thing that stood out for me was Auriel's Bow. That's a powerful weapon, and I sure as Oblivion don't want the vampires to get hold of it. The Moth Priest can stay here for now. As for the vampire, I still don't trust it, so keep it on a leash." "For too long we've allowed these vampires to poison the night and kill our people! Now, we finally have the means to strike back! We now have Auriel's Bow. The gods themselves have favored us and we must answer with action! The time has come to finally put an end to Harkon and his unholy prophecy! We will march on their lair and destroy those wretched abominations so they can no longer corrupt our world! This is our fight and this is our fate!" You can now ask him what to do now, to which he'll say, "It's time we take the fight to their door. Gather your things and rest well, my friend. 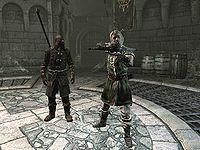 We meet outside Castle Volkihar." When he arrives outside the castle, he'll say, "We're done with this when none of them are left standing. Let's go." Isran: "I... I suppose this is difficult for you." Serana: "I think my father really died a long time ago. This was just... the end of something else. I did what needed to be done. Nothing more." Isran: "I think perhaps... I think you did more than that. You have my thanks." He'll then turn to you and say, "So, the beast is destroyed. Not only that, but Auriel's Bow is in safe hands. The Dawnguard will now be dedicated to safeguarding it, making sure that prophecy will never come to pass. You've served Skyrim well. Even with these vampires gone, the fight isn't completely over. Once we're settled back in at the fort, there will be more work to do. We'd be honored to have you join us." 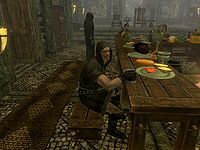 Sometimes, when asking members of the Dawnguard what can you do to help, they'll point you to Isran by saying, "Speak to Isran. He has something for you." When you ask him what you can do to help, he'll describe a new vampiric threat, saying, "The Jarl's in danger. A vampire plays as a visiting 'advisor' to the court. Destroy it before it's able to complete its foul business. But be warned. 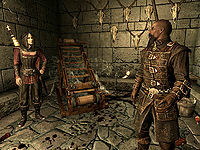 The Jarl's guards are unaware of the threat, and will treat violence against this 'advisor' as a crime. Convince the Jarl of the threat and he'll let you destroy the creature. If not, then do your best not to get caught. Quickly now! The longer you delay, the more danger the Jarl is in." You will then be directed to a random court to deal with the infiltration. When you come back after you successfully killed the Visiting Advisor he will hand you a random enchanted item and say, "Good. Maybe now they'll afford the vampire threat a tad bit more respect, eh?" After speaking to Sorine about her worries, when you tell him you need to find Florentius Baenius, he'll say, "Who said something, Sorine or Gunmar? I thought they'd have learned their lesson by now. I don't trust that man, and I don't want him here." If you tell him to forget it, he'll say, "No, just..." If you say Sorine thought he'd need his help, he'll reluctantly say, "I suppose she's right. I shouldn't let my personal feelings get in the way. Last I'd heard of him, he was aiding the Vigilants of Stendarr at Ruunvald. He may still be there. If he can maintain some appearance of normalcy, I'll allow him to stay." If you ask Sorine why Isran wouldn't want you asking about Florentius, she'll just simply say, "The two of them just never got along. That's why Isran didn't have you go looking for him when he sent you after us." Isran: "They threw me out, Tolan!" Tolan: "I know, and I'm sorry that happened. But now..."
Isran: "Well what did you expect, Tolan? Didn't I tell you? Didn't I warn you this would happen? Look at these fools, so concerned with tending their precious "beacon." Why not just scream at the top of your lungs "Here we are, monsters! We're oh so tasty! Come and get us!"" Tolan: "Isran, these vampires are different. I know you've disagreed with the Order in the past..."
Isran: "Yes, you've explained yourself. I'm supposed to just throw myself in front of you all and offer protection, am I? Years of mocking, of dismissal... and now suddenly here you are, begging for help." It seems that during A New Order he was also supposed to say to you, "And I suppose you're the one Tolan says is actually doing something about this mess. These Vigilants are nothing but talk." You would then have two options, tell him him you were aiding Tolan, in which case he'd say, "It certainly seems the Vigilants of Stendarr can't help themselves. No surprise there." or ask him if he'll help, to which he'd respond, "Well, I certainly can't help any less than the Vigilants of Stendarr, now can I?" He would then say, "Do we at least know what the vampires are after?" If you would have told about Serana in the crypt, he would have said, "None of this makes any sense. What does she have to do with this?" You would then have two options; to tell him you don't know but you think she's connected, or say she wanted to go, to which he would have said, "Why her? What significance does she have? We don't have enough information." or "None of this feels right. We need to know more." respectively, followed by, "Well, it seems the Dawnguard really is needed again. While I ready things here, you find out what this woman means to the vampires. She must be important somehow. I'll admit, I don't know that I can trust you, but I know I can't rely on the Vigilants for anything. So we'll have to work together for now. If you can prove you're reliable, maybe you can join the Dawnguard. We have ways of dealing with vampires." This page was last modified on 27 September 2018, at 11:11.